Forget The Regular, Boring & Outdated Night Lamps – The Innovative Color- Changing LED Lights Are Here To Stay! Would you enjoy reading your book or relaxing always with a different light color? Would you like to spice up your next house-party with some fun lamps that can offer more than mere lighting? Then, you are looking in the right place! 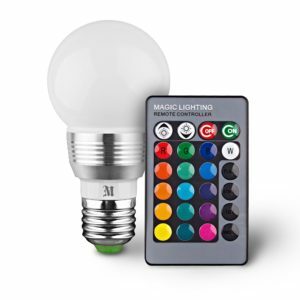 Bring The Latest Technology of LED Lights At Home- Meet The Unique Color Changing LEDs With Remote Control By Massimo! This amazing LED provides you with 16 different color choices that you will definitely love. And how can you choose which color you prefer? Just by using the super easy to handle remote control! SMART COLOR CHANGING LEDS: Have you ever thought that you could turn your house’s dull yellowish light into an interesting green, blue, red or white? Well, now you can! These LED lights do not only change among these 4 colors but they have 12 more different bright shades, and even flash! With these ingenious lamps you will never get bored! REMOTE CONTROL FOR YOUR CONVENIENCE: What’s better than operating your lamps’ color or mode through a handy remote control, while you are still seated comfortably in your sofa! With the innovating technology of this set, you definitely can! Choose your favorite color and also the mode you prefer easier than ever. You have a wide variety of choices available, including smooth, flash or strobe mode, 12 different color shades and brightness level; just by pressing some keys. Impressive, right? GET IT WITH CONFIDENCE: Being so sure about the high quality of this product, Massimo offers you a 30-day money back satisfaction guarantee! Try this amazing LED light along with its remote control today, and in the improbable case that it won’t meet your expectation, you will take your money back!